Long before Newton was “occasioned by the falling of an apple” the common assumption was that a two pound object fell twice as fast as a one pound object (Aristotle). Galileo contradicted Aristotle. After he dropped a few things from the Leaning Tower of Pisa and had them reach the ground simultaneously, what everybody knew-to-be-true changed. Following this tradition, we tested the assumption that painted acoustical foam would not absorb sound as well as natural, unpainted acoustical foam. It didn’t work that way, although we still read that it does. 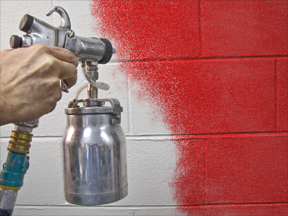 Paint is applied by spraying in multiple, light surface coats to avoid sealing the surface or saturation of the foam, producing no significant change in performance. The following lab results show that the NRC values for 3-inch and 4-inch acoustical, anechoic wedge foam are identical. (Before rounding to nearest 0.05, 4-inch painted foam measured 0.01 above the natural!) The slight, and insignificant, degradation in test performance for 2-inch painted acoustical foam, 0.04 - 0.05 (rounded), could have been caused by the differences between the acoustical characteristics of the natural (unpainted) foam. Sixty-four square feet of material in an 8' x 8' configuration was placed flat on the floor, near but not at the center of a 17' x 20' x 15' high reverberation chamber. The perimeter edges of the material were taped ot the floor. Testing was carried out in strict accordance with ASTM: C423-77 test procedure. Precision at ninety percent confidence limits for the absorption coefficients was ± 0.03 at 125 Hz, less than ± 0.015 at 250,500, and 1000 Hz, and less than ± 0.025 at 2000 and 4000 Hz. *Noise Reduction Coefficient (NRC) values are reported per ASTM C423-77 to the nearest 0.15. Actual values in the INTEST reverberation room are shown for reference. The difference between the sprayed and unsprayed 2" sample could have been caused by the differences between the acoustical characteristics of the natural foams. Note: Contrary to cartoons and folklore, Newton was never hit on the head by an apple, he just noticed it and wondered why things fall. The Leaning Tower of Pisa cannot be proven as the “drop site” in Galileo’s experiment. *NOTE: IF YOU WISH TO REFER TO THESE TESTS, PLEASE CREDIT ACOUSTICS FIRST® CORPORATION AS THE SOURCE. WE CANNOT AUTHORIZE USE OF THE "INTEST" NAME BEYOND OUR REPRODUCTION OF THIS ORIGINAL PRINTED SUMMARY.